This software was created by Roland Bischofberger and Emanuel Duss during a bachelor thesis at the Hochschule für Technik Rapperswil (HSR). Our project partner and advisor was Compass Security Schweiz AG . We thank Compass for the nice collaboration and support during our bachelor thesis. The extension is divided in two parts. 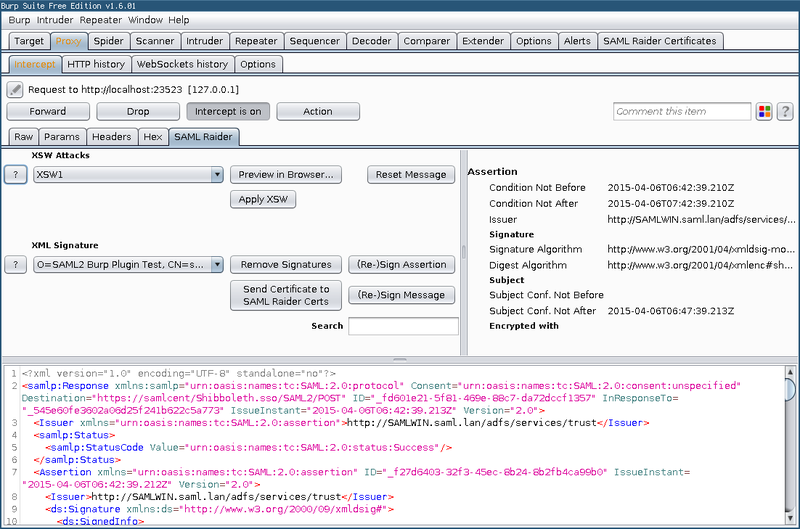 A SAML message editor and a certificate management tool. Start the Burp Suite and click at the Extender tab on Add . Choose the SAML Raider JAR file to install the extension. The easy way to install SAML Raider is using the BApp Store. Open Burp and click in the Extender tab on the BApp Store tab. Select SAML Raider and hit the Install button to install our extension. Don't forget to rate our extension with as many stars you like. To test SAML environments more comfortable, you could add a intercept rule in the proxy settings. Add a new rule which checks if a Parameter Name SAMLResponse is in the request. We hope the usage of our extension is mostly self explaining. Use the JAR file in target/saml-raider-1.0-SNAPSHOT-jar-with-dependencies.jar as a Burp extension. To start the Extension directly from Eclipse, import the Repository into Eclipse. Note that the Eclipse Maven Plugin m2e is required. Place the Burp Suite JAR file into the lib folder and add the Burp JAR as a Library in the Eclipse Project ( Properties → Build Path → Libraries ). Open the Burp JAR under Referenced Libraries in the Package Explorer and right click in the Package burp on StartBurp.class and select Run As... → Java Application to start Burp and load the Extension automatically. To enable the Debug Mode, set the DEBUG Flag in the Class Flags from the Package helpers to true . This will write all output to the SAMLRaiderDebug.log logfile and load example certificates for testing. 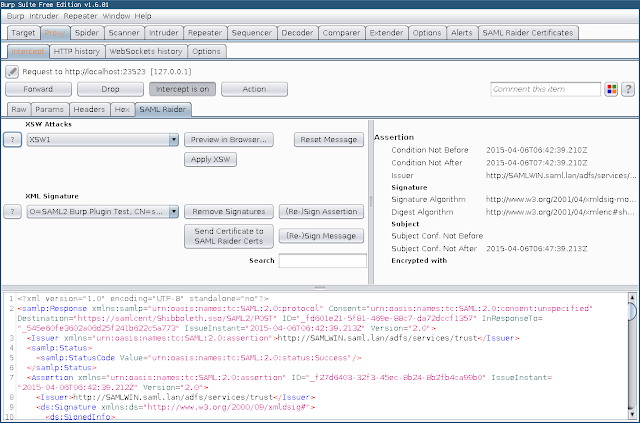 To send a SAML Response to Burp, you can use the script samltest in the scripts/samltest directory. It sends the SAML Response from saml_response to Burp ( localhost:8080 ) and prints out the modified response from our plugin.